There is so much I could say about this couple.. but Jaime is one of my closest friends, and I absolutely love her to pieces. She and I met while working at the same private school in Port Coquitlam as Autism Support Workers/Education Assistants. We instantly clicked, and spent our entire lunch breaks together, and would go shopping after work, and drink way too much Starbucks together. Jamie is one of the sweetest- she genuinely cares ALOT, and will do pretty much anything for her friends and family. She is one of those life long friends that will always be around and will always have your back. I'm so excited that these two are getting married- Jaime and Dustin have known each other since high school, and now they have two beautiful children together! You have probably seen these two all around my website with their kids... I have pretty much captured their life for the past three years (thanks for being my professional models guys!). They are tying the knot on Thanksgiving weekend, and it's going to be such an incredible day with their friends and family. What I love most about these two is that they know how to laugh hard and have fun together! Dustin was sporting a mustache for our shoot... Jaime's favourite look. Ha ha. 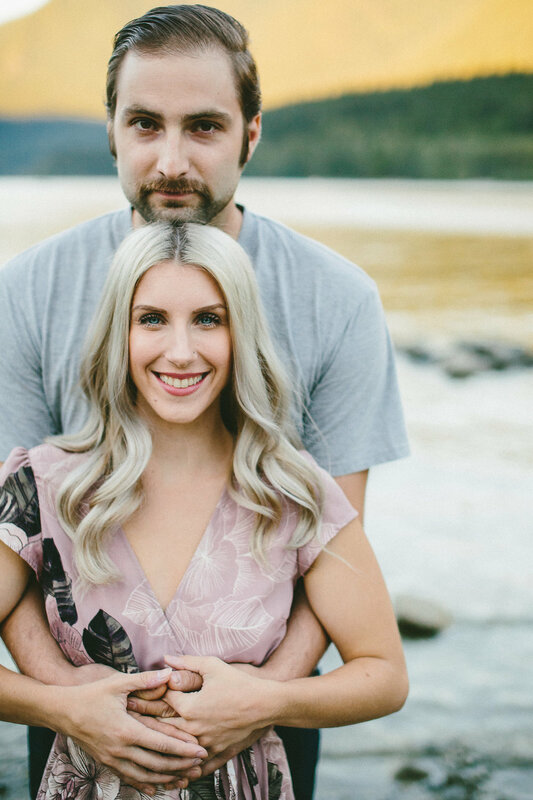 I just love these two, and we chased some gorgeous sunset light up at Golden Ears Park in Maple Ridge, and I was ecstatic for how it translated into my lens.